NIOS will take this Registration Fees for 2nd year through Online mode only for admission in courses 501, 502 & 503 courses. Accordingly, D.El.Ed II Year Registration Fees is Rs. 6,000. Last Date for submission of II Year Admission Fees is extended upto 10 August 2018. 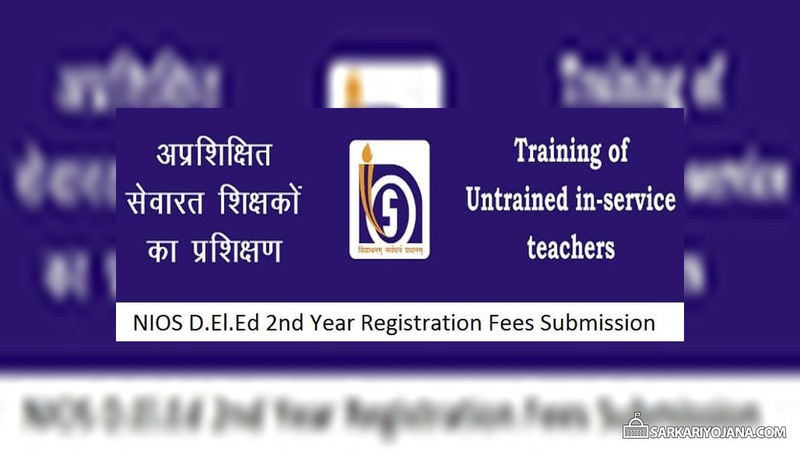 NIOS D.El.Ed Second Year Registration Process has started and lines are open for registered teachers. 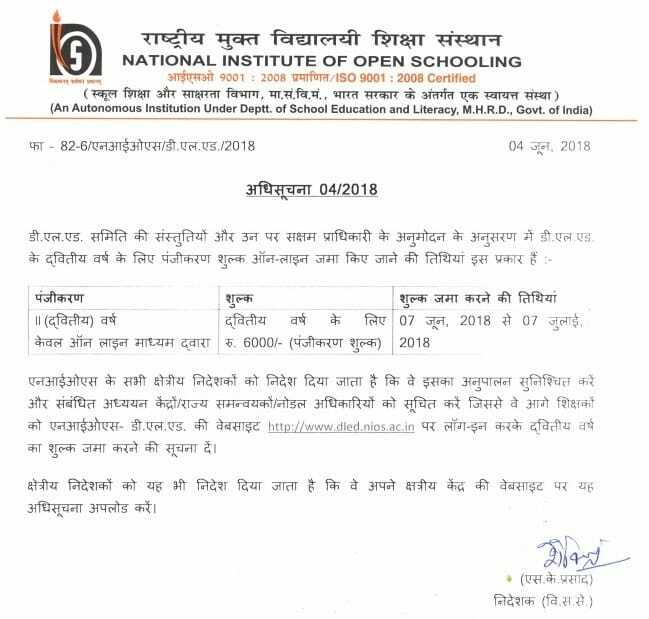 So, candidates can submit the admission fees for II year before nios d.el.ed 2nd year registration fees last date which is 10 August 2018. Here candidates have to enter the NIOS D.El.Ed Enrollment Number and then click the “Submit” button. Then candidates will be redirected to the Online Payment for II Year registration fees to get admission in Second Year in NIOS D.El.Ed. Moreover, candidates must take a printout of the online receipt after successful payment as confirmation to the fees submission. Moreover, candidates can also check their Payment Status by entering the Enrollment Number anytime. Important Note On Payment Status – If the Payment is debited from your account and Payment Status has not been changed from “Payment Not Made” to “Payment Completed”, please do not make another payment. All such candidates must not panic but just wait for 1 Hour, Payment Status will get updated. Then candidates can check their status by providing your Enrolment No. Candidates can fill the dled registration fees of 2nd year which is Rs. 6,000 for each teacher. Candidates can fill their Second year Admission Fees between 7 June 2018 to 10 August 2018. Accordingly, candidates can fill the nios II year registration fees of Rs. 6000 before 22 July 2018. Also Read – NIOS D.El.Ed. Exam Fees September 2018 Online Submission of Second Examination Fees has been started for Courses 501, 502, 503, 504, 505. SIR MY NAME IS HYMAVATHI I UNABLE TO PAY THE 504, 505 PAPER FIRST YEAR SECOND SEMESTER HOW SHALL I PAY IT. I TRIED A LOT BUT IT IS NOT SHOWING IT IS IT CLOSE THE DATE OR HOW TO PAY SUGGEST ME PLEASE. Dear Sir/Madam, you have made a payment of Rs. 6060.00 to SECRETARY NATI INST OPEN SCHOOLING NIOS vide eazypay reference ID 18070226898493. Enrolment No. – 09010604408016, Name – Pooja Devi, Father Name – Miter Pal, Percent XII – 50, Category – OBC, Status – Payment Completed, Bank Name – ICICI-BANK_PG, BankTxnRefNo – 1.80702e+013. Your payment status is updated, check it now. I am unable to pay the fees online for the 2nd year registration for the DEl Ed program. It says server error. Please help. I am getting trouble in registerring in 2nd year nios d.el.ed because the server is not working server is error. Time is passing. What to do now. 2nd year admission dled not possible due to the error occure. I am getting trouble in registerring in 2nd year nios d.el.ed because the 2nd server is not working server is error. Also the 1st server of icici bank is not working. Time is passing. What to do now. What to do now?